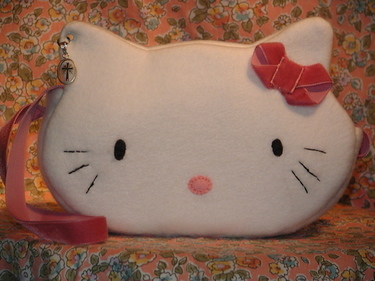 Here's a Hello Kitty purse that I made for Max's friend Alexandra. H.K. is white fleece, lined with interfacing and some foam wrapping for stiffness. Because this is a baptism present, H.K. also sports a cross earring. And inside, there's a pocket for the itty-bitty-kitty. 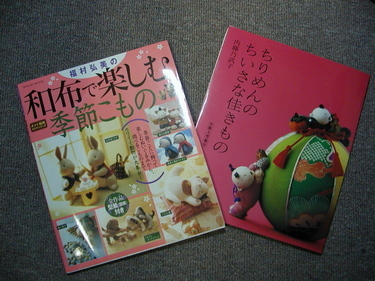 In the last pic, itty-bitty-kitty is wearing the egg mask from the Easter egg kit. I hope she likes them! OK, now that she's gotten it, I can post this picture. 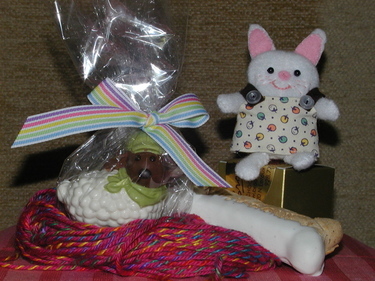 Here's what I sent to Monica for Operation Haremail: a chocolate sheep, an itty bitty bunny, a truffle (under the bunny), and a white-chocolate dipped dog bone for Monica's border collie, Maggie. Look at what I received from Monica in the Operation Haremail trade! 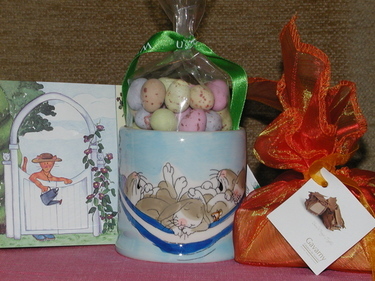 Yummy yummy chocolates from London, an adorable bunny mug, and a very cute card that she made! Thanks so much Monica, and yours is on the way too... Receiving chocolate in the mail is a great way to start the week! 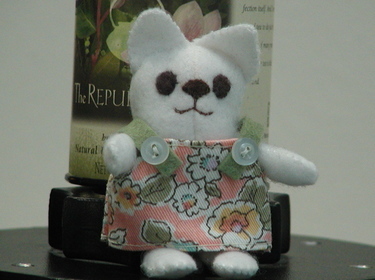 Here's itty-bitty-kitty from my new Japanese doll book, "Palm-Size Stuffies". She's only 4 inches tall from tip of ear to bottom of toe. Despite her small size, she was actually pretty easy to make. I love that her arms and legs move, so cute! For the next one, I'll put on smaller eyes, these are a little large and probing. I think she needs a larger wardrobe, I'm going into my stash. You might recognize her current dress as the same fabric as flower-wiener-dog; for reasons I don't recall, I bought a huge amount of this fabric. I'm going to have to start making bigger things if I'm going to use it up. 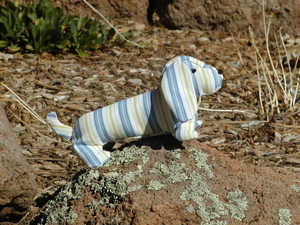 Here's Max's request, a wiener dog from some blue stripey fabric. The fabric is quite ravel-y so I expect I'll have to make regular repairs. It's because of this that I decided to stuff with fiberfill rather than my recently-acquired small stuffing beads. Speaking of beads, here's Max playing with some of mom's. Separated toddler dishes make good bead corrals. 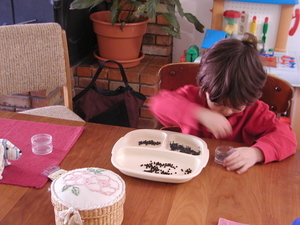 He's always liked organizing, so he spent quite some time putting the beads back in their separate containers. This past week has been pretty hectic, but now it's over! Yeah! 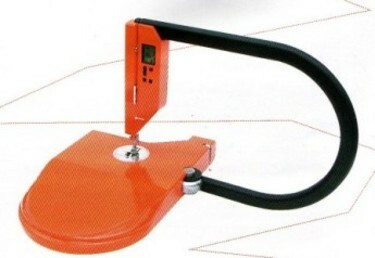 No data will be analyzed this weekend! The weather here is predicted to be the nicest of the year, so of course we have plans to go someplace else. But it should be nice in Phoenix too, if a little warmer. We're going to hear Chanticleer, an all-male vocal ensemble, they sound amazing. We'll also do some shopping in the big city (my hubby isn't all that excited about this part, but we'll go to REI so he won't be too upset). I was reading over my past few posts, and it seems that I'm easily obsessed (with mochi, peeps, and Japanese stuffed animal patterns). I guess I have to admit that it's true. And it's especially true when I know I should be doing something else. Like my data analysis. A toaster that puts Hello Kitty on your toast! Wouldn't that bother you to eat it? Similar vein to the other Hello Kitty embossed food items found before, like Hello Kitty sushi. 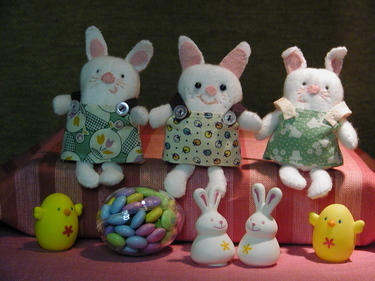 I've become a little obsessed with Japanese small soft toys, ever since some crafty blogger (sorry, I can't remember who) turned me on to this very cute world. 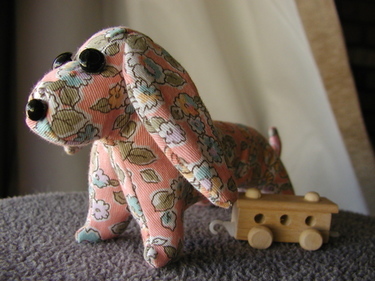 I now have three of the books, and this is my first creation from one: a flowery stretch dog! I think his eyes are too big and have bought smaller eyes but haven't gotten around to replacing them yet. Max immediately claimed flower-dog as his own (even though I intended her as a present for someone else), plus thought it would be a good idea if mom made another one out of a blue stripey fabric. All I can say is...just wait a little while hun, the blue one is in the works. But sometimes my other work gets in the way (like it has this week). 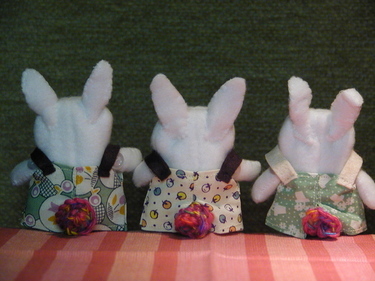 Having to bring work home really cuts into my Max-time and sewing-time. After I finish Max's stretch dog requests, I plan to make the really cute chihuahua and kitty dolls. As if that weren't enough, look at the great new books that just came in on Monday! No plans yet, but it won't take long to develop them. When will I find time for knitting again? My summer tank may not be done by this summer!